Sundays are good days for a family to get out and relax somewhere, and give Mum the day off cooking duties. The best way is with Sunday Brunches, but for those with children, the short attention span can cause premature curtailment, finishing the whole idea of relaxation very early. 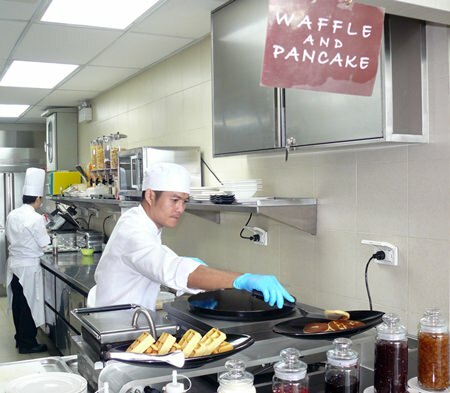 The answer to all this, according to the Holiday Inn, is their Sunday Brunch, where in addition to the traditional brunch, they have entertainment and activities for children to keep them amused and occupied, while the parents can sit back and enjoy themselves. 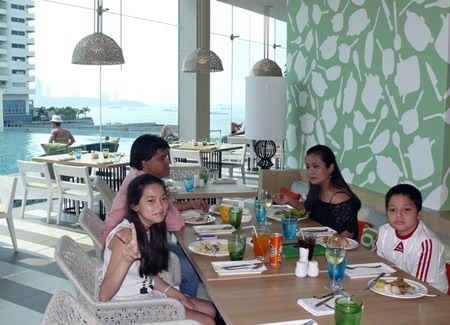 So with two children in tow we went to the Holiday Inn’s Family Sunday Brunch at East Coast Kitchen. Now, the East Coast Kitchen is in the new executive tower (behind the old tower) on the 6th floor. Note that if coming from the car park you have to go to the lobby and change elevators from there. The restaurant is behind glass giving it a very light and airy atmosphere. 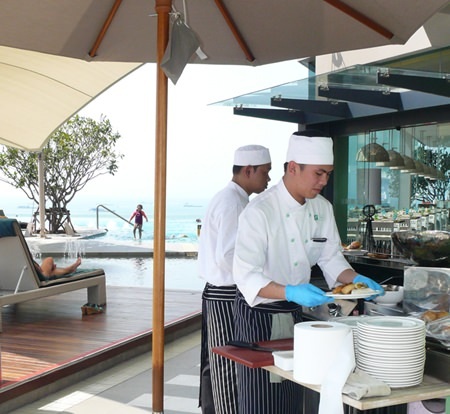 Right beside the restaurant, on the 6th floor, is a swimming pool, with views out to Pattaya Bay from the decking. Great ambience. 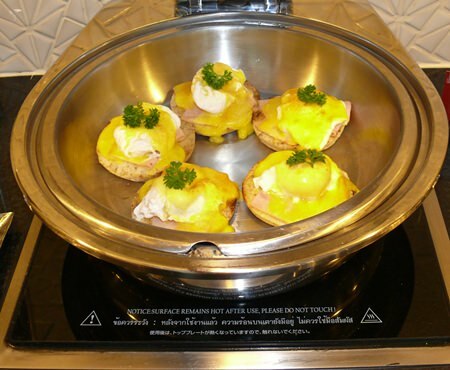 Most of the Sunday Brunch buffet items are along the back wall of the restaurant, with three live cooking stations with one outside. 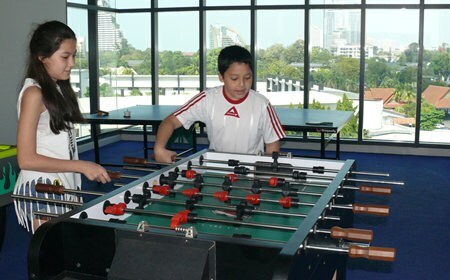 Across from the entry, there is a Kids’ Club with table tennis, air hockey and other games, and then a fully enclosed area with Nintendo games and televisions showing cartoons. And as an additional activity, the children can swim in the pool where you can see them at all times. My advice with all buffet presentations is to slow down and take your time so that you know exactly what is on offer and that way you don’t miss something that may be a favorite. While doing that we ordered the Free-Flow wine, and the Chilean white was very pleasant to relax with, and at B. 599 the wallet was quite relaxed too. The children were not forgotten with their own free-flow of Shogun orange, pineapple and soft drinks. The list of items on offer is too long to list but some of the items included a pancake and waffle live cooking station with a choice of toppings, Eggs Benedict with sliced butcher ham, another live station with whole roast pork leg marinated with fennel and garlic, another live BBQ station preparing cheese hamburgers, hot dogs, grilled chicken and vegetable wraps. We all had different items we enjoyed most, and for me it was the roasted pork leg with different sauces/mustards, and the grainy Dijon style was mine. For Madame, it was the grilled sea bass fillet with asparagus and spicy salsa. For the children, the pizza squares were the favorite followed by some different desserts, such as chocolate whoopies with vanilla cream and boysenberries, meringue nests with sliced kiwi and raspberry, strawberry swirl cheese cake and even Angry Bird cup cakes. Of course we tried many other items with the spaghetti, tagliatelle, rigatoni with Alfredo sauce, Napolitana sauce or mushroom sauce for the pasta enthusiasts and a fried rice that had one of my children going up for more. That was after a couple of plates of Tropicale Pizza squares – a novel presentation. Me? I finished up with the cheese platter with Emmental, French brie and Gorgonzola Dolce. I also ‘braved’ the largest coffee making machine on the planet – considering I have trouble with the remote for the DVD player at home, I did what I do at home – I got my 10 year old daughter to make one for me! Another very positive feature of this brunch is the price. B. 1,000 for adults for a Sunday brunch running from noon till 2 p.m. Free-Flow wine at B. 599. Children 7-12 at half price and children 6 and under free. Entertainment and activities for children means adults can relax. And we did. Holiday Inn have a winner with this concept. Do try next Sunday! It certainly won’t break the bank. 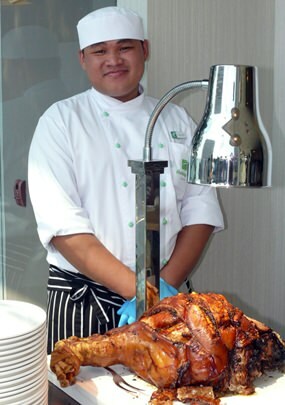 The Holiday Inn, 463/68, 463/99 Pattaya Sai 1 Road, entrance from Sai 2 or Beach Road, Tel 0 3872 5555, secure parking. Brunch Sundays from noon till 2 p.m. Adults B 1,000 net, children 6-12 half price, under 6 free.